I recently traveled to Sweden and had the opportunity to talk to many people about the work that ICN and C3N are doing. Now here in the US, I am known for talking at length about this work, all the time, to whomever will listen. But sometimes it takes being far removed from it for a few days—and seeing the reaction of a completely new community—to not only gain a deeper understanding of what we are building together but also to articulate it in ways I hadn’t before. In other words, I got to look in from the outside. I got to spend time with Swedes who are innovative and caring improvers and people in their own right. They are doing things that we haven’t thought of yet. Their national registry system is a model for us and a CF clinic I visited is taking telemedicine & patient engagement to the next level (their patient representative was one of three people meeting with me!). Despite all they have achieved, they are so hungry to learn more than just surface facts about networks like ImproveCareNow. The questions that they asked were prescient—the very questions we have been asking ourselves lately (tough questions about data transparency and funding and leadership). They were generous in sharing their ideas about the answers to these questions, kind when stating the obvious, and strategic in sharing what the perspective or potential application to their industry or project would be. Most of all, they were patient when I tried to explain how all of the pieces fit together in a Network that is frankly quite complex already and getting more complex by the day. I hope that they learned a bit from me too. Even when I was giving a talk at a “Patients' Day” run by the national health media company, many of the patient representatives in the audience (who were clearly already making major contributions to the systems in which they work) were amazed at the depth of patient engagement in ICN. The fact that we are moving toward making parents and patients not only partners, but co-leaders, garnered a lot of response. They wanted to know WHY it is working in our system. I explained that it is probably a combination of things (including maybe a little bit of luck!). The more I talked about it, I realized the most important part is experience and generosity in sharing it—the life experience, not just the illness experience, brought by our partners. A lot of people asked me what my role as quality improvement director really entails and what the day-to-day looks like in a QI Network. And as I responded, I realized that the routine part of the work—teaching QI, trying to plan innovative webinars and Learning Sessions, and asking (gently of course!) our teams to do more and more all of the time, is just a small part of the picture. And it is probably not the most important one. I had some time to reflect on what else I do as I walked around Stockholm. Like many cities, it is full of common areas—beautiful parks and other open spaces. I watched how people used these spaces. I talked to people as I walked around them. 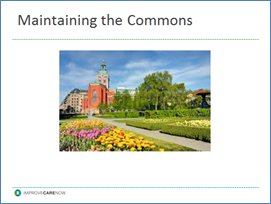 And it helped me reflect on what I think is the most important role for me and the rest of our quality improvement team—helping create and maintain our commons so that people can connect and create there. 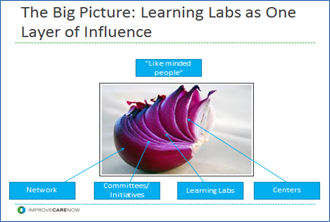 I was pushed to think about and better articulate how the many pieces of this Network fit together—learning labs, committees, individual centers, and increasingly active professional groups. I have used this onion image before to talk about how the layers fit together, but following my conversations there I added a box at the top titled “like-minded people” right before one of my talks. The layers can’t work together unless you connect people who are passionate about the same things. The box isn't the right way to show it yet (and we’re not doing it just right yet! ), but I’m working on it. Finally, I learned the word for “life’s work” in Swedish: Livsuppgift. 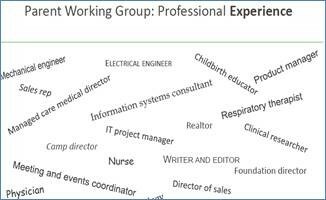 So many of us in ImproveCareNow see this work as more than a job. 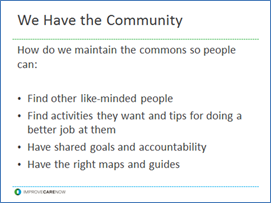 In addition to being part of something that is improving lives, I think a big part of it is the community, or the commons we are all a part of. 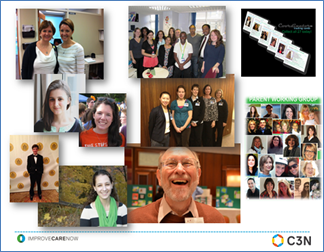 This community is made up of clinicians, patients, parents, researchers, and others who want to be a part of it because of what we are doing together. The relationships built with one another in this Network are often rooted in friendship, respect, and humor in addition to a shared purpose and method. And we don’t hide it, we celebrate it. This, to me, is why it feels like life’s work. Stay in the LOOP - Sign up for updates and never miss a post! Follow us to get the latest.